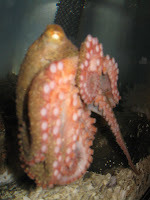 PTMSC Blog : I'd like to Introduce you to Ruby...our new Octopus! I'd like to Introduce you to Ruby...our new Octopus! I'm excited to report that Brian from the Department of Fish and Wildlife collected an Octopus for us! Libby thinks it may be a female, so until we learn otherwise we will assume that! She is a Red Octopus (Octopus rubescens) but I just call her Ruby! We have had her for a few weeks now and she is slowly getting used to her new home. 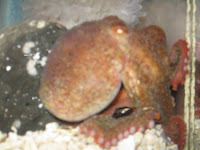 Usually she hides behind the rocks so we rarely see her except when cleaning (Octopuses are nocturnal). Today she put on a quite a show for the few people in the exhibit by eating a shore crab right in front of us! Adult Red Octopuses feed on crustaceans, mollusks and fish. Shore crabs seem to be a favorite for our Ruby. It was amazing to watch her eat! She sensed the movement of a little shore crab and her tentacles glided swiftly over to it. Then she scooped down killing it with secretions from her salivary glands. After eating the body, the Octopus then breaks the shell apart and pulls of each leg while eating it. An Octopus has many defense mechanisms; not only can it change colors to blend in extremely well, it has a sharp beak that can cut skin. It can swim quickly and can squirt out a cloud of ink to reduce to visibility of the water. Ruby did an amazing job blending in with our sponge rocks...she seemed to take on the mossy texture and coloring of the rock. You may have the chance to meet Ruby the next time your visit our Marine Exhibit!